I thought I'd share a brand new recipe with you guys today. Fresh out of my head, not even finished baking it yet! It's a variation on the white bread that I've been making of late. I LOVE bread, I really do. There's so many things you can use it for. I like my breads simple and unfussy. 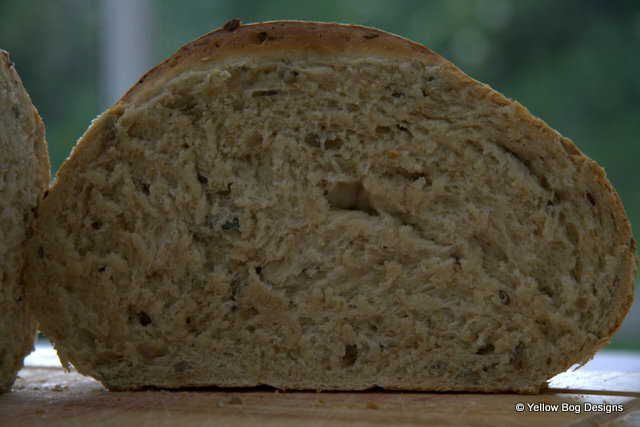 The Big Guy likes this bread too but he adores seeded bread so I figured I'd go for the best of both worlds and make my favourite bread seeded this time and see how it went. I don't know about any of you but I for one hate buying bread. I know how simple it is to make so it just seems wrong to purchase it. Standard sliced pans seem too fluffy and insubstantial since I started making my own and I balk at the prices for artisan breads - what I'd pay for a single loaf I could buy the ingredients and make 4 or 5 myself! Plus who can resist the smell of freshly baked bread, or the seemly magic process of watching the dough rise? That's the best part about making bread yourself, you're not just getting the end product but the whole experience. It brings back memories in such a rush too, sitting in either of my grandmother's kitchens, watching the bread some out of the oven, smothering the still-warm slices in butter and home-made jam and then running outside to eat it in the sunshine, shooing away curious bees attracted by the sweet, warm stickiness. Try putting that in a wrapper! Nothing can evoke memories in quite the same way that scents can. The smell of coconuts will always remind me of holidays in the sun, and of sunburn! Orange blossom always brings me back to the time I spent in Toronto, though I have no idea where that connection was made. Fresh lemons remind me of my Mum making us pancakes for breakfast, tomatoes remind me of one of my aunts and the greenhouse she had in her former home in Dublin. Scent connects us to our past, to moments shared and experiences we'd almost forgotten. A final word on this dough before I dive into the recipe; it can be used for almost any variation. The standard dough, sans wheat bran and seeds, makes a lovely white bread. Just leave them out and follow the rest of the recipe as it is. It also makes lovely pizza dough, simply roll it out and cover it in the toppings of your choice after the first proving, then pop it in the oven. It makes insanely good toast with a slightly sticky, chewy texture. Sliced and covered in peanut butter and chopped banana it is the super quick anytime of day snack (honestly, try it - peanut butter and jelly be-damned!). I've made it with beer today but you can use water too, I often do and it's just as good. It can also be used as the base for fougasse (basically a french style focaccia). Anyway, on with the recipe! Tip the flour into a large mixing bowl, there's no need to sift it. For the dried yeast you can just pour it in too. The fresh yeast needs to be crumbled in and rubbed into the flour a little (like you would if making pastry or a crumble). Add the wheat bran, salt and sugar (or honey) now too. To get your hand-hot liquid I find that it's best to take about one-third of the overall liquid and boil it, then add the cold two-thirds. This ensures it's warm without being too hot (it needs to be warm enough the activate the yeast but not so hot that it actually kills it!). Add the oil to the liquid and give it a quick stir. Make a well in the centre of your dry ingredients and pour in all the liquid and oil mix in one go. Mix quickly using your hand (or a wooden fork) to make a soft, sticky dough. Make sure you wipe the dough around the bowl to pick up any loose flour. Sprinkle a clean work surface with flour and turn our the dough onto it. Knead the dough by stretching it away from you, and then folding it in half toward you before stretching it away again. Give it a quarter turn and repeat. You'll get into a rhythm after a minute and it's a great way for working out any stress or frustrations! After a few minutes make a little pocket in the dough and pour your choice of seeds in here. Continue kneading for a few more minutes until you have a nice scattering of seeds throughout and the dough is smooth. Put the dough back in the mixing bowl, cover with a clean tea towel and leave to rest for an hour. The dough has risen enough when it has doubled in size and springs back when you press it gently with your finger. This is the first proving. Tip the dough onto a floured surface once more and knead gently for a few seconds to remove air bubbles (knock it back as it's called). Shape into a round and place on a non-stick baking sheet. Make 3 or 4 slashes across the top with a sharp knife. Cover once more and rise for 30 minutes (this is the second proving). While it rises preheat your oven to 240C/475F/Gas Mark 9. Bake for 30-35 minutes until browned and crisp (you'll know it done if you tap the bottom of the loaf and it sounds hollow). Cool on a wire rack. This bread should keep for 2-3 days but honestly, it's normally all gone by the next morning in this house! I know looking at this it can seem like a lot of work but honestly it's not. It can be made even easier for you too. Want fresh bread in the morning but don't have 2 hours to play with? No problem! Instead of leaving the bread to sit for one hour to rise at room temperature you can make it up to step 5 above the night before and then pop it in the fridge to rise slowly overnight. Get up the next morning, follow step 6, turn the oven on to heat and then go jump in the shower. By the time you're done the bread will be ready to pop in the oven and you're done! By the time everyone else is up you've fresh bread on the table and you can seem like a kitchen wizard - able to knock out yummy bread in no time!